"Rockton embodies flexibility and elegance in landscape design with extended 18” x 13” dimensions for a more fluent finishing touch. 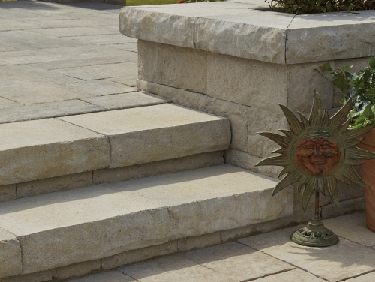 With a graceful, hewn face, and refined colour palette, Rockton harmonizes well with many of Oaks pavers and wall stones as a stylish wall coping or seat wall. Used as a step unit, Rockton’s size also allows for ease of installation while delivering a versatile and stable solution for transitions in elevation."